You’ll be relieved to know that today’s post is a quickie, both in the writing and the recipe. Tomorrow Miss R, Mr A, my lovely in-laws and I are headed to Barcelona for a week. And I have done nothing in preparation. I don’t even know where my summer clothes are (I am still wearing long sleeves and socks). So, this will be super speedy so I can get on with ferreting around in cupboards for shorts, and dust off ancient, rarely used flip flops. And throw away expired, half-empty bottles of sunscreen. 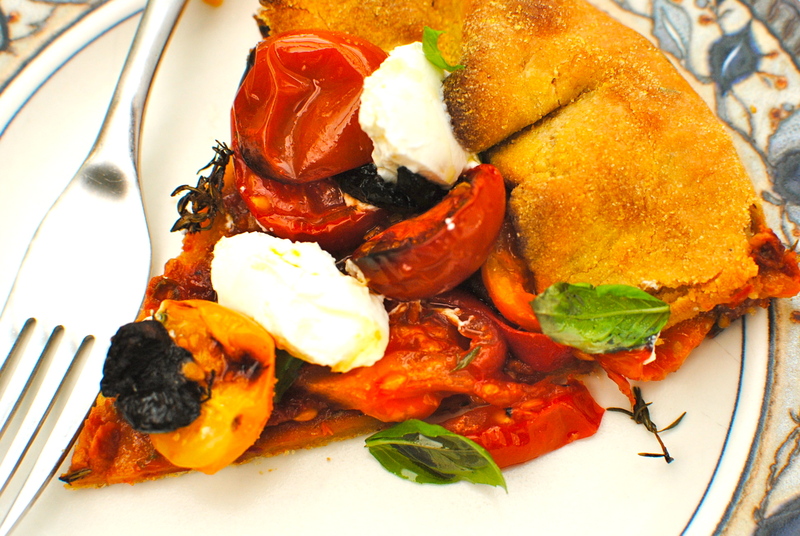 But before I head upstairs I will polish off the last bit of this goats cheese crust and tomato tart, a la Nigella. Yes, I’m going to stand in front of the open fridge, but no, I will not be doing it in a dressing gown or licking my fingers lasciviously. Who does that?? 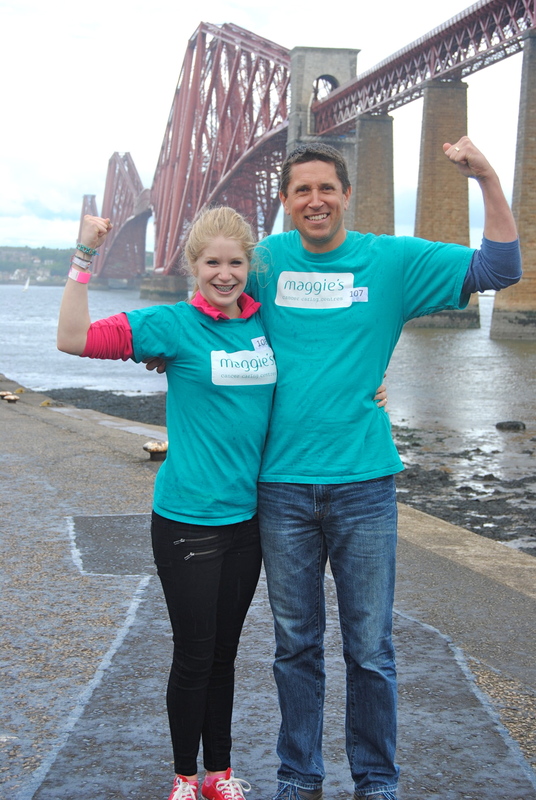 I also want to publicly congratulate my Miss R. Not only for plucking up the courage to do a 165 foot drop/abseil from the Forth Rail Bridge last Sunday, but also for raising a tremendous amount of money for Maggies Cancer Caring Centres. As for me, her mother, it was almost unbearable to watch, especially as the wind picked up just as she and two fellow brave souls started their descent. But the massive grin on her face told me she was loving it. She actually wanted to go again! 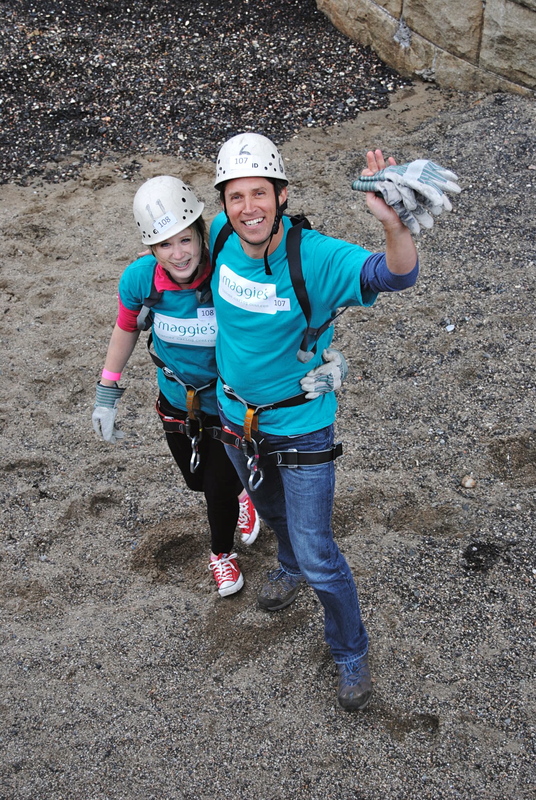 Mr A abseiled as well, so congrats and big hugs to both of my sporty, fund-raising heroes. Grandma, Bobby, Poppy and I are so proud of you both. I won’t be posting next week so I hope all of my American friends have a wonderful Fourth of July. See you all on the 17th. With a tan, I hope. 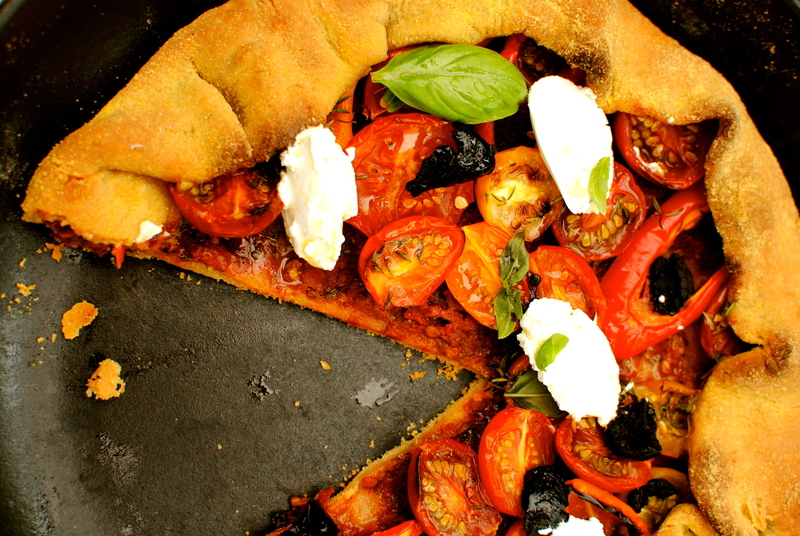 This freeform tart has a lot going on taste-wise – tomato tapenade, herbs, fresh tomatoes, and the surprise of goats’ cheese in the crust, as well as on the crust. As an extra wee fillip, I have used olive oil in place of the traditional butter. 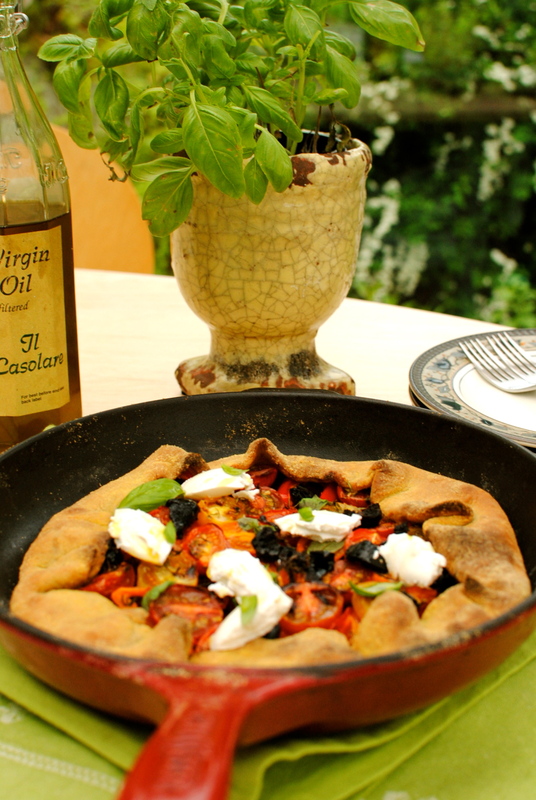 I really like an olive oil crust as it gives a lovely crisp texture and subtle interesting taste. If you like the sound of an olive oil crust, but without the cheese, please check out my Tandoori Cauliflower Tart. 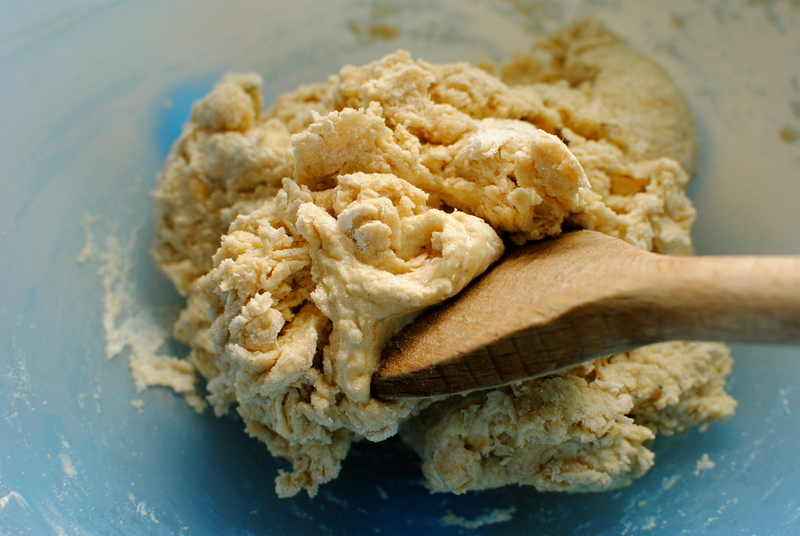 *enough ice-cold water to make a soft but not sticky dough. I used about 2 tbsp, but it depends a lot on the thirstiness of your flour and the wetness of your cheese. In a large mixing bowl, sift together the flour and salt, then stir in the thyme, cheese and olive oil. Once this has come together add in 2 tbsp of ice-cold water. If you feel it needs a bit more add just a few drops. Knead briefly in the bowl then roll out on a floured board to fit come to the top of a 20 cm (8 inch) or 26cm (10 inch) diameter baking tin OR, as I did, iron skillet. Sprinkle in about 2 tsp of cornmeal or polenta before carefully transferring the dough into the tin. 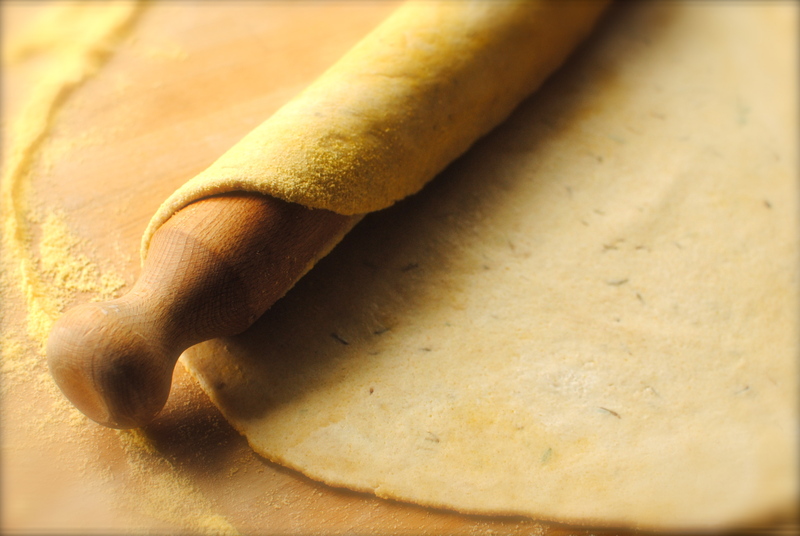 I roll the dough loosely – about halfway – onto the rolling pin then hover the pin at the pan’s midpoint before letting it drape evenly (hopefully) into the dusted pan. Let this hang out in the refrigerator for about 30 minutes so that the gluten relaxes. 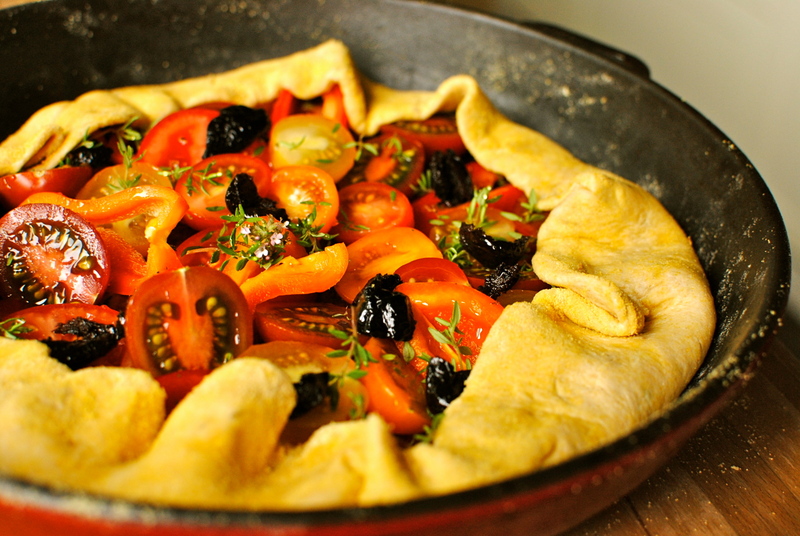 When you are ready to bake, pull the cool dough out and spread on the tapenade and nestle in the tomatoes, peppers (if using), and sprinkle over the thyme leaves, olives and drizzle on about a tablespoon of flavourful honey. Finish with some black pepper. Fold the edges over loosely. If you have a shallow tart tin you can trim to fit the edge but I quite like the freeform, ‘this is meant to be messy’ look. Pop the tart into a 200C/400F oven until the crust is uniformly browned – about 20-25 minutes. Let the tart cool a bit before adding any spoons of goats cheese and basil leaves. Cut and serve with a green salad and maybe something like my Late Summer Salad, So Summery Chickpea Salad (my fave), or Brazilian-style Black Bean Salad. Want to try another type of tart? How about Sweet Potato and Black Kale Open Tart with Pear and Cranberry Slaw? OHH MY GOSH! This looks sooo good..I am drooling! 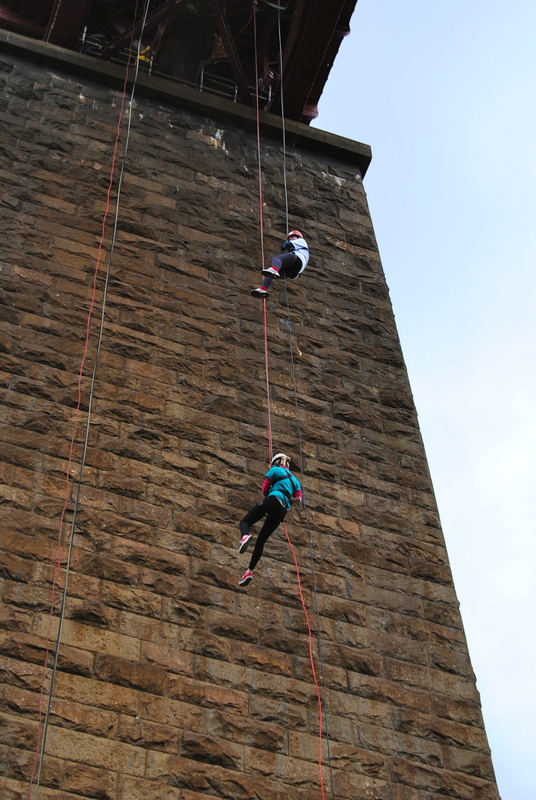 Massive congrats to Mr.A & Miss.R for their brilliant abseil off our hopefully soon to become World Heritage Forth Rail Bridge and on doing it for such a fantastic charity. Recipe is utterly mouth watering and a lovely riot of colour. I cannot wait for your Barca-inspired recipes shortly! It was all quite exciting. 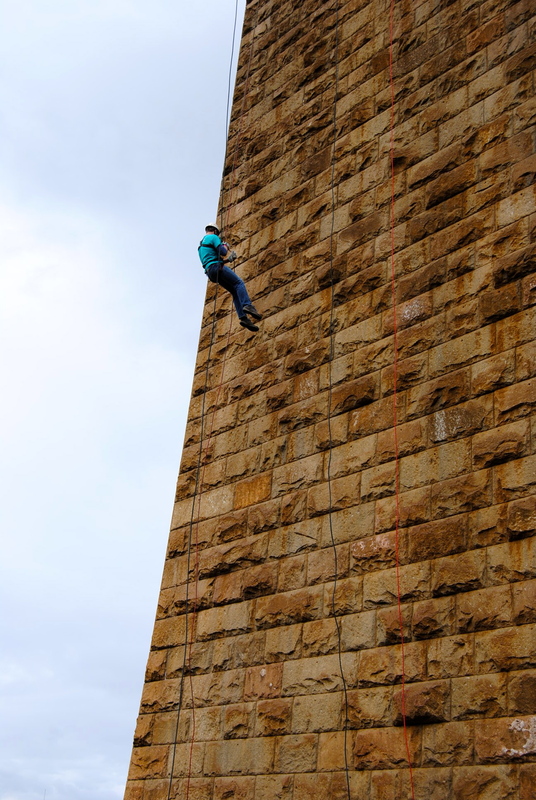 Although Mr A had done it before the thought and sight of my precious baby dangling from the bridge, and trusting the abseil team to get them all down, was almost more than I could bear. But they had a great time, as you an see. Maybe some Barca-inspired recipes? Congrat’s to Miss R & Mr A! Have a good & relaxing holiday. Glad you are back in action. As for the potatoes they are brilliant on pizza, especially with slow-sautéed garlic. And it’s a super simple dough so I hope you make it and fill it with anything you like. Goodness! This looks so amazing, I can’t wait to make it. 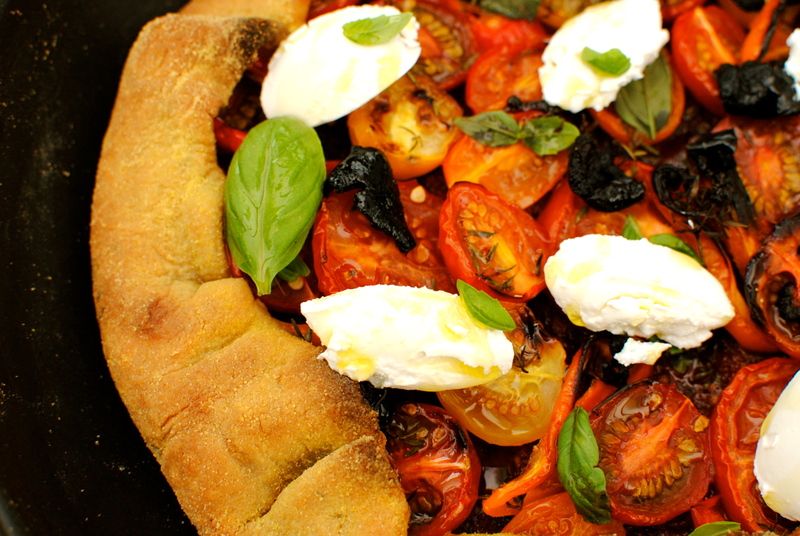 We have an abundance of tomatoes from our patio garden, and this is just the thing to use them in today. Thanks for the recipe! So jealous of you going to Spain! My husbands parents are from Esturias in the north. Enjoy!! I’m sure you will come back inspired for some great Spanish infused food! LOVE IT! Another use of the cast iron skillet and it looks heavenly. Honestly, I don’t think you can think up a bad post. Have an awesome time on your vaca. I shall be enjoying the 4th without eating anything (the 5th is the LAST day of the cleanse, HOORAY) and watching fireworks…. Thanks Tahmina. And kudos to your awesome willpower! Maybe you can have leftovers?? Congrats to your family and it’s great to see the pics of them. I really enjoy your posts with the new food ideas and I still make your sweet potato sticks. Your ex neighbor from Cumberland Street. I’m afraid I’ve packed light (damn those cheap airlines!) so it’s only my phone camera. Maybe I can nick some of father-in-laws photos: he’s an artist so his packing light is one outfit & tons of paint & cameras! Wow, they are daring — congrats to both of them! And it’s fantastic that they raised money for such a wonderful cause. Your tart looks divine. The filling alone is enough to lure me in, but that goats cheese crust really seals the deal. Thanks so much. We are here in Sitges & it is truly fantastic. A wonderful blend of old & new architecture with warm temps & cooling ocean breeze. I’m glad you like the look of the tart crust. Not going to do any baking while I’m here though! The food looks fantastic, as always … hope you have a great, safe, trip. Be sure to tell Miss R that repelling down the Sagrada Família is frowned upon, exciting though it may be. Will do! Tomorrow is Barcelona so La Sagrada Familia is on the cards, but probably just an external viewing this time. My lungs aren’t up for a good roam around just yet. But my appetite is almost back so I hope to take advantage of its near return. Thank you for your good wishes. 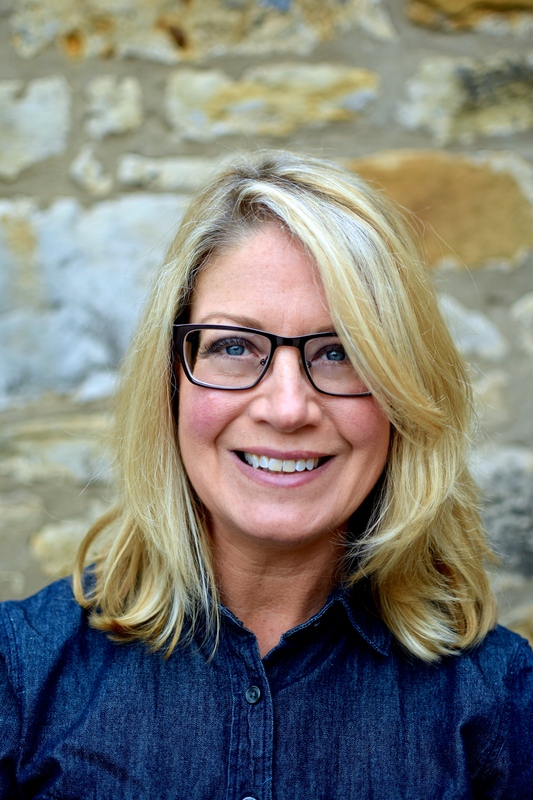 I’ve just found your blog and it’s a complete treasure trove of info and recipes. I’m a nutritionist with psoriatic arthritis and landed here searching for some good soft food recipes for my sore jaw joints ( and that savoury bread pudding is going in the oven ASAP as I miss bread terribly). I’ll be popping back often! Thanks so much Kate – what an incredibly kind comment! Quite a few people I see need soft food diets at least temporarily, while quite a few need or benefit from low-fibre (including me occasionally). Glad you like what you see. Please give any professional/personal comments as you see fit – glowing or otherwise. This looks delicious! And the pictures make me want to stop doing my work and start cooking! Also, I love how this recipe looks (and probably tastes) like a gourmet dish, but is simple to make if you follow the directions you gave. 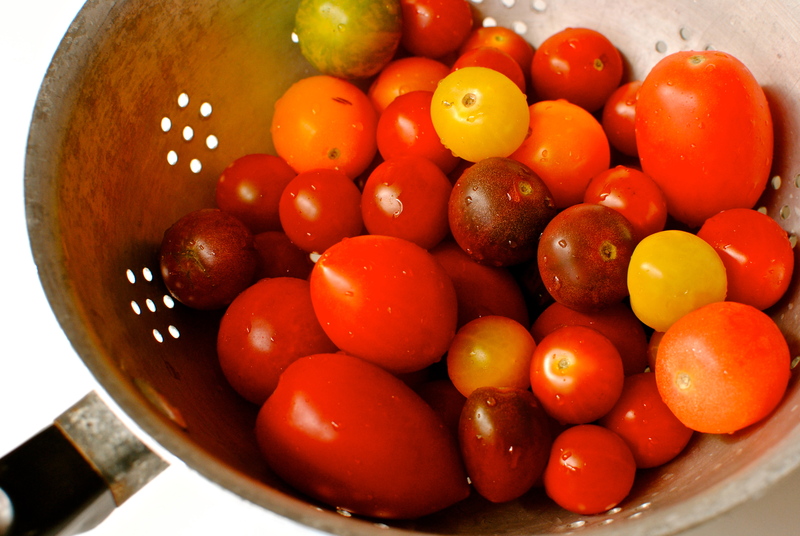 This recipe reminded me of summer because of all of the beautiful colors! I like the gourmet tag! 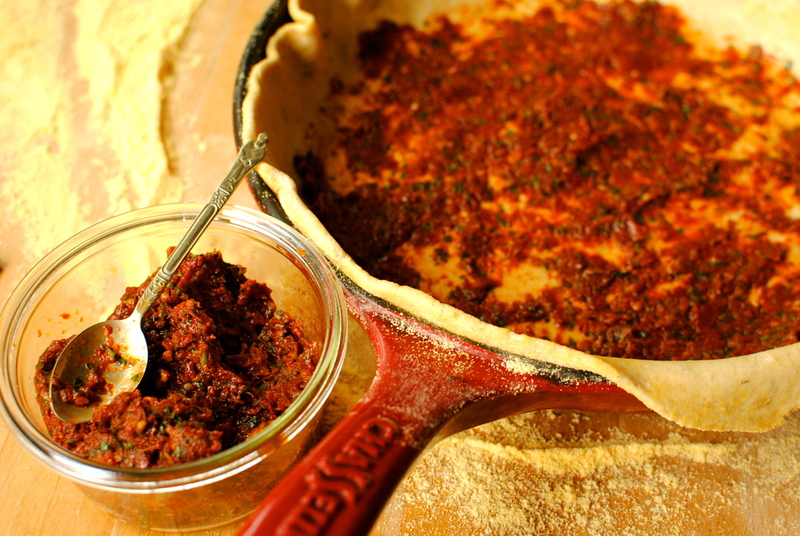 It is very simple and you can use the dough for an infinite amount of savoury fillings – blind-baking if you use wet fillings, or not – as in this recipe.